Pedestrians gather before Chattanooga emergency personnel arrive at the scene where the front of the Cheeburger Cheeburger building collapsed at the intersection of Aquarium Way and Market Street on Wednesday just before 2 p.m. in downtown Chattanooga. This is a developing story and was updated March 29 at 10:37 p.m.
UPDATE at 10:37 p.m.: Market Street has reopened. Aquarium Way between Market Street and Cherry Street remains closed. Forward thinking and caution taken by the owners of Cheeburger Cheeburger may have prevented injury and saved lives. 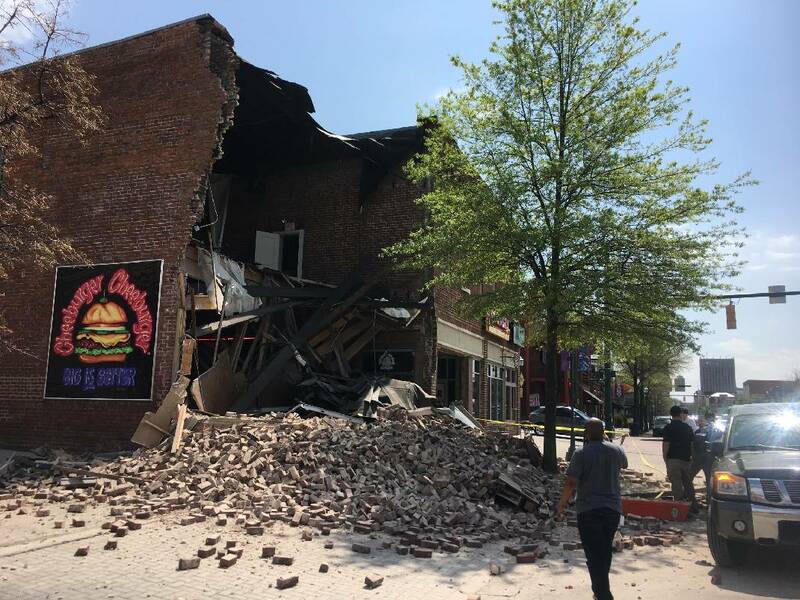 The building on Market Street collapsed midday Wednesday, but no one was inside at the time, the Chattanooga Fire Department confirmed. And that was thanks to the decision of the owners, Charlie and Rene Eich. "If anyone would have been in there at the time, they would have been injured or killed," Garner said. "So kudos to the owners of Cheeburger for making sure they were being safe and for closing their business down until they could figure out what was actually happening." A building inspector had warned them of structural problems a few days ago, Garner said, and as a precaution, the owners closed the restaurant for business last night. The owners heard noises while outside the restaurant prior to the collapse, went in to investigate and soon exited, catching the collapse on video, he said. Police blocked off the northbound lanes of Market Street and the portion of Aquarium Way that runs along the building's south face. Officers taped off the area, citing concerns over the entire structure's stability. A structural engineer, demolition contractor and representatives of the city's building inspection office were brought in as the demolition process began. The crew will remove loose parts of the building until they are confident the remaining portion of the building is safe to leave up, according to the release. They are not sure at this time if any of the structure can be saved. "This may be a long operation," Fire Chief Chris Adams said. "They're going to tear it down incrementally and evaluate periodically. If they can leave part of the building up, they'll do that. If they're not satisfied it's safe, they may have to tear it all down. Safety is the number one priority." Cheeburger Cheeburger shares an interior wall with the now closed Genghis Grill and Chattanooga Ghost Tours Inc. Firefighters were able to bring out some of the owners' personal belongings including computers, frozen food and pictures before the demolition, according to the release. "We're just glad — miraculously — nobody got hurt," Garner said.